Threatened woodland species such as Capercaillie will require good breeding seasons if they are to recover. Gamekeepers have backed a national park's recommendation that owners keep dogs on leads during the breeding season, believing this should be extended to other national parks. The Scottish Gamekeepers Association (SGA) argued during debates regarding the 2003 'right to roam' legislation that dogs being allowed to run free during the breeding season could cause problems for wildlife. 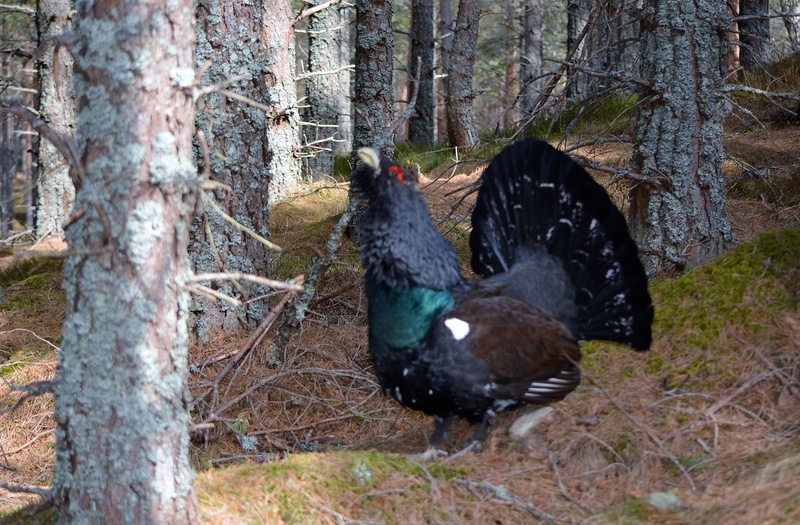 Now with ground-nesting species such as Curlew and Dotterel added to the red list last year and woodland birds such as Capercaillie critical, the SGA has backed the Cairngorms National Park Authority's stance that owners keep dogs on leads. Last week, the CNPA urged park users in the Cairngorms to keep their pets leashed during Spring and into the summer months, with birds sitting on eggs or with young during those times. The Cairngorms contains 80 per cent of the country's remaining Capercaillie which are highly vulnerable to poor weather, predation and disturbance at breeding time. The Land Reform (Scotland) Act 2003 does not make a lead compulsory for dogs but owners have a responsibility to keep them under close control, or on a short lead. Now the SGA has encouraged other national parks to follow suit by recommending a similar sensible approach to give threatened wildlife a chance. SGA Chairman Alex Hogg said: "This is not about banning dogs or denying anyone access but, with some of our ground-nesting birds in real danger, there are sensible steps that can be taken by everyone and we feel the Cairngorms National Park Authority's message is a responsible one that could be followed by others. "As an organisation which represents 5300 members that are managing land for a living, we argued for two years that dogs should be on a lead from March to July because we could see what could happen for birds. Instead, the term 'close control' went into the final 'right to roam' Bill back in 2003. "Other European countries have progressive access laws but still would not allow dogs to run freely during a critical time for wildlife. There is enough pressure as it is today on many ground-nesting species and I am sure considerate walkers and other countryside users would see sense in this during the breeding window. "It is possible that designated dog-walking areas, away from breeding sites, could be created where dogs could be allowed off the lead and to run and maybe that is something that needs to be looked at again." Last December's Birds of Conservation Concern report showed there are now more red listed species in Scotland than ever before. Twelve farmland species, 12 upland birds and 16 woodland birds are on the list and will require good breeding seasons if their numbers are to climb again. In March Police Scotland and The National Farmers Union mounted a joint initiative to remind dog owners of their responsibilities under the Access Code after the highest incidence of livestock worrying in six years (133 cases).